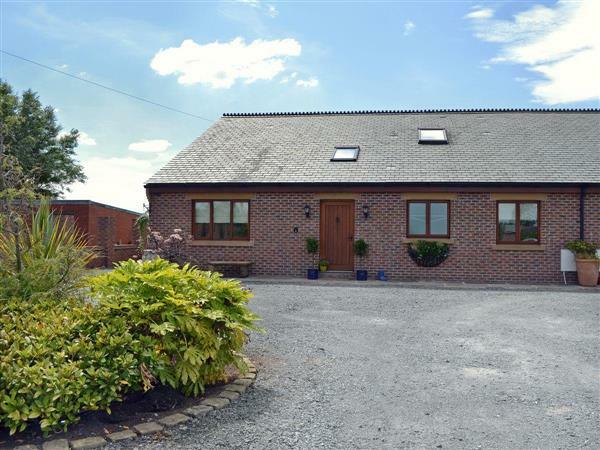 Carr End Barn in Stalmine, near Poulton-le-Fylde sleeps 8 people. Carr End Barn is located in the village of Stalmine; this stunning barn conversion, one of a pair, provides spacious and luxurious accommodation in a quiet rural setting that is ideally placed for exploring Lancashire, the Fylde coast and beyond. Thoughtfully designed on the inside and out, Carr End Barn offers all the comforts one expects from a holiday home including a well-equipped kitchen, contemporary bathrooms, comfortable bedrooms, Wi-Fi, Freeview TV, X-box One and a wood-burning stove to warm those long winter evenings. The exterior is equally impressive. The decked patio enjoys lovely views over open countryside and is perfect for hosting a barbecue (provided), whilst the children play games on the large lawned garden. There is a fantastic outdoor hot tub which can be enjoyed all year round and should the weather take a turn for the worst, you can retreat to ‘The Cave’. 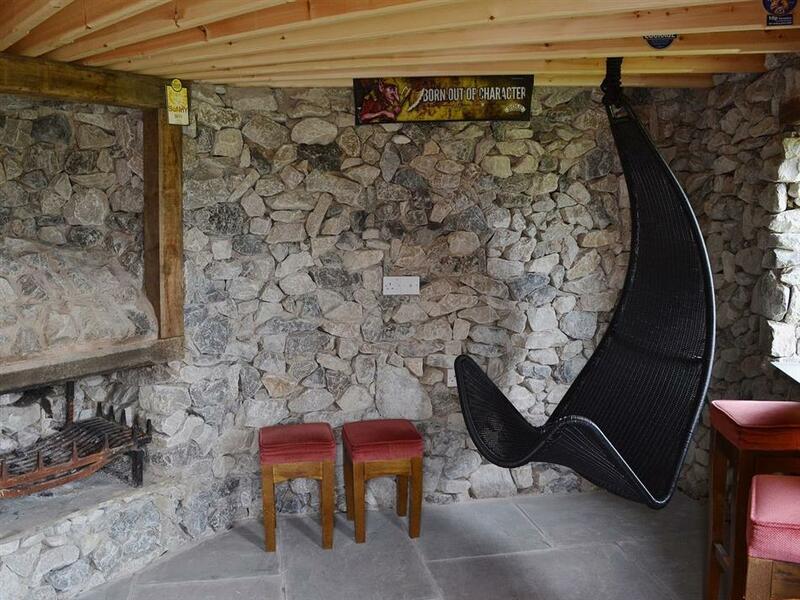 Built by the owner as an indulgent folly, this stone built cave is heated, weatherproof and has comfy seating, TV and an open fire. The owner will also allow guests to have use of his own full size snooker table (subject to availability). Stalmine is located approximately 5 miles from the small market town of Poulton-le-Fylde, which has a good selection of shops, bars and cafes. Other places worth visiting along the Fylde coast include Thornton Cleveleys with its old fashioned charm and promenade (7 miles), Fleetwood with its Freeport Outlet Shopping Village (10 miles) and of course Blackpool (9 miles), whose many attractions include the Tower, Blackpool Zoo, Pleasure Beach, Sea Life centre and Madame Tussauds. Apart from being accessible for the coast, Carr End Barn is also well-placed for exploring rural Lancashire. Ribble Valley with its pretty villages, excellent walks and abundance of country pubs is within an hour’s drive, as is the Forest of Bowland, which is a designated Area of Outstanding Natural Beauty. The Lake District and Yorkshire Dales are also very accessible by road and can be reached in an hour. The city of Lancaster is just 13 miles away and Preston is 19 miles. Offering a superior level of comfort, excellent facilities and with so much to see and do in the area Carr End Barn really is the perfect destination for a family holiday that can be enjoyed all year round. The beach is 4 miles. The shop and pub are ½ mile, and the restaurant is 3 miles from Carr End Barn near Poulton-le-Fylde. Spacious, beamed living room/dining area with wood-burning stove, French doors and well-equipped kitchen with breakfast area and wooden floor. Two double bedrooms, each with 5ft bed and TV; one with en-suite wet room and toilet. Twin bedroom with TV. Bathroom with toilet. Mezzanine: Sitting room with TV. First floor: Double bedroom with 6ft bed, TV and en-suite wet room with toilet. Pets allowed at Carr End Barn. For a better idea of where Carr End Barn is, you can see Carr End Barn on the map below. You can find more large holiday cottages (that's cottages which sleep 8 or more people) in Lancashire. If you want to see more large cottages, have a look at large cottages in Lancashire. Carr End Barn is in Lancashire; should you be on the lookout for a special offer, you can find all the special offers in Lancashire. It's always worth checking to see what is on offer at the moment. Do you want to holiday near Carr End Barn (LR8), you can see other cottages within 25 miles of Carr End Barn; have a look to find your perfect holiday location.